Phoenix, AZ -- Somos Independents is an organization led by Mexican-American women leaders across this Nation. 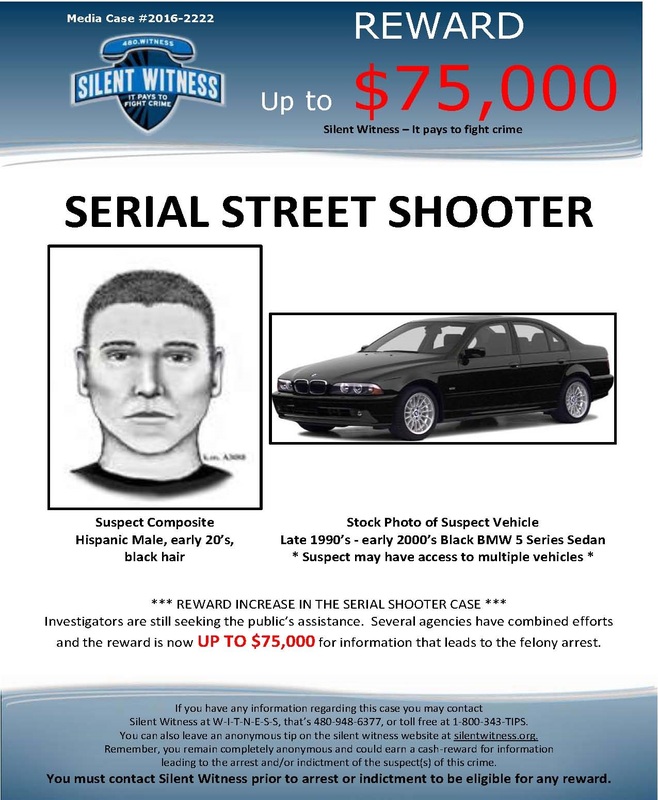 We are happy the reward monies have increased to $75,000.00 in an effort to catch the serial shooter that has affected victims in the mostly Maryvale area in Phoenix, Arizona. We are also glad to know that the FBI and other federal agencies are supporting local law enforcement in order to catch the serial shooter. We are responding to the call to action issued by local law enforcement in an effort to help catch the serial shooter at a grass roots level. We are inviting block watch commanders, and community members and leaders from the areas the serial shooter has affected. Somos Independents has hosted 2 bilingual "Maryvale" Murder shooter events at the Maryvale Public Library since families of the victims are Mexican American and we want to increase communication to all Spanish-speaking members of the community to help catch the killer. 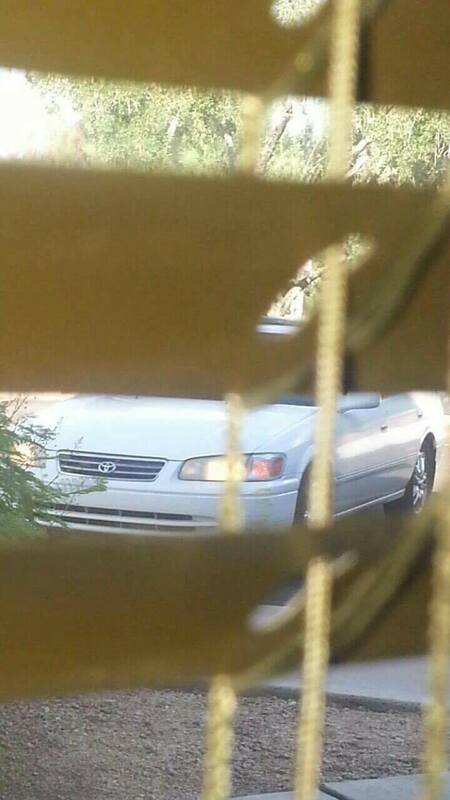 The Spanish-speaking population in the Maryvale area and other areas affected by the serial shooter is extremely high. We expanded our outreach to raise public awareness at a Mega Church in West Phoenix that is home to hundreds of Chicano and Latino families in the mostly western Phoenix but their membership also expands throughout all of Phoenix. 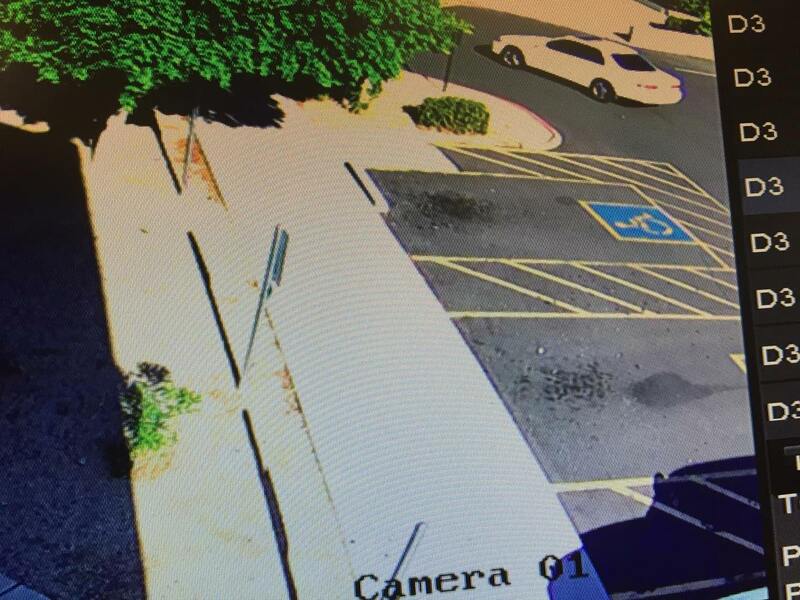 We were not surprised to hear Latino families had not heard about the serial shooter when we hosted an event at the Palm Valley Church where video can be seen here. GOP registered voters beat us Independent registered voters by about 200,000 so far this year. Democrats remain 3rd place with Independents at 2nd place and still ahead of the Democratic voting block by about 600,000 voters. I repeat, Independents are ahead of the D's by 600,000 voters. A little bit of political Chicano advice to the Democratic leadership: Stop demonizing pro life Catholic Latino/a Democrats. Keep in mind that Hillary Clinton wisely chose an Irish Catholic Dem who is pro life in his private life as VEEP material. When you get local Democratic leaders such as Aaron Marquez who is the Vice Chair of AZ Dems using the Vice Chair position to influence people against "Hispanic"pro life Catholic Democrats, the AZ DEM leadership will lose the edge with regard to the growing Catholic Chicano / Latino Democratic voters. They ought to choose the hill they wish to die on, and in my opinion the growing Catholic Latin Democratic demographic is not really a fight they will win considering the Pope Francis of Rome is #ProLife. A huge chunk of Latino Catholics do pay attention to the pro life cues the Pope makes. If the Arizona Democratic Party leadership continues to interfere in the Democratic primaries and picking favorites -- they will continue to be in 3rd place in this state. This evening Cartwright School Board Member, Lydia Hernandez, suggested increasing public safety and awareness to the approximate 19,800 students and their parents with regard to the Maryvale serial killer. Superintendent Dr. Chavez supported the idea and the need to increase public safety with the school children and their families. Dr. Chavez is going to draft a flyer and a letter informing students and their families with regard to what is going on to increase public safety and present same at the next board meeting for approval. Watch video here to follow the proposed idea and the outcome of it. House Bill 2023-Ballot Harvesting-Bill makes it a felony to collect your ballot at your door step and take it from you with the intent of submitting it for you at the polls. The bill passed the House and Senate and was signed into law by Governor Ducey in 2015. For the record, I do not support the bill, however, I do feel strongly about informing my community about the law and its implications. HB 2023 is law and we have to respect it and work on changing it. I have spent over 20 years in community engagement in organizing events of large magnitudes, to teach in ins and educational forums all in an effort to empower, inform and engage the community. I have obviously been in it for the long haul. The kind of volunteer work that I have been involved in is long term because I am investing in the development of human capitol. I am a direct reflection of my community and I know how time and time again we continue to be victimized by unscrupulous people and industries. We as a community have fallen prey to folks wearing sheep’s clothing, they resemble us and speak our language, however, don’t always have the best of intentions. We, by culture are trusting and welcoming to those that don’t seem like a threat however, sometimes we are given bad advice or have been asked to sign documents that trick us out of our homes and livelihoods. I am sure that nonprofits and immigrant rights groups understand this very well. I have built my whole life’s reputation on fending for our community, that work did not begin when I ran for office. I have earned my community’s trust and have worked hard to defend them from repeated abuse. 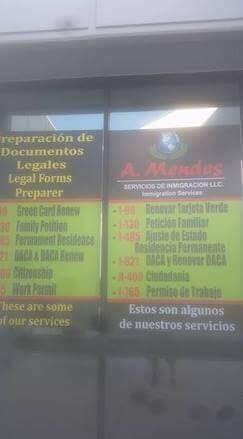 As a state representative, I drafted legislation regarding these same issues, the right to pay for work performed, driver’s license since 1996 when I worked with then Senator Joe Eddie Lopez and Housing licensing requirements and making it criminal for committing fraud and practicing without a license. Today, I continue in the same community work. With respect to this bill, my behavior is no different. There is a new law that makes it a felony to collect ballots door to door and the penalties are criminal making it a felony and up to $150,000 in fines. I don’t want anybody in my community to fall prey or to be involved. As always, I will continue to inform. Groups with good intentions are not the issue, however, this practice in the wrong hands can cause great damage and set us back from any progress that we have made. I firmly believe that our community is an intelligent one and will engage when it needs to. The voting process is relatively easy, receive ballot, vote, sign and seal it and return it, postage paid. We have 30 days in which to return it by mail. We don’t and shouldn’t develop a culture in which we build crutches. We are resilient and will rise and engage when informed and empowered. I don’t believe that this is a voting deterrence for our community at all. Our community is a diligent and hardworking one. One that doesn’t want things to be given because we work for what we have, this is part of our Latino family values. We don’t need to play the victim card on this one. Our community can speak for itself and that is reflected through its strong family and religious values; devout Catholicism and Christian roots and pro-life. Folks, let’s look at policy and experience. I have dedicated my entire adult life to community engagement out of personal need. My family has been directly impacted by the issues I have advocated and championed over the years. My depth of knowledge on the issues is far greater than any other candidate running for office in my district. I have served on the Cartwright school board for 12 years, and under my leadership turned a failing school district around. Cartwright is the 2nd largest elementary school district in the state, is the highest paying in teacher salaries and we went from an “F” to an “B+” in a year and a half, on an operational budget of approximately, 100 million. School size, budget, demographics and other dynamics are important factors to equate towards successful leadership. In addition, I have taken my leadership and expertize to higher levels by taking on elected leadership roles at national; National School Board Association officer and National Hispanic Caucus of Latino Legislators; Immigration and International Relations Chair among many more over the years. Coupled with leading the 2006 and 2007 massive marches on Immigration in Arizona and involving Arizona in the national Immigration conversation for the first time speaks for itself. I am a true representation of my constituency, am deeply vested and committed to doing everything that I can to leverage resources and attention to our neighborhoods. My vote is not up for grabs by public interest groups that are willing to pay for my campaign so as long as I speak as I am told. I am running for hard working families that depend on my service of representing them. I have done nothing short of that and I will continue to do so. La propuesta de ley HB2023-referida como Cosecha de Boletas-Propuesta de ley que hace el hecho de colectar boletas (de votación) de puerta en puerta con la intención de entregarlas a las urnas el dia de elecciones es una felonía. La propuesta fue aprobada por la Cámara y el Senado y fue firmada a ley por el Gobernador Ducey en el 2015. Para su información, no apoyo esta ley, pero firmemente siento la necesidad de informar mi comunidad sobre la ley y sus implicaciones. La propuesta HB2023 es la ley y hay que respetarla y trabajar para cambiarla. He dedicado más de 20 años en involucrandome en la comunidad y organizando eventos de grandes magnitudes, desde enseñanzas y talleres a foros educativos, todo con el fin para empoderar, informar e involucrar la comunidad. Obviamente he estado involucrada para el largo plazo. El tipo de trabajo en cual yo he sido voluntaria es de largo plazo porque se trata de invertir en el desarrollo del capital humano. Yo soy una directa refleccion de mi comunidad y se muy bien que una y otra vez continuamos caller víctimas de personas y industrias sin escrúpulos. Nosotros como comunidad hemos caído presos ante gente vistiendo ropa de ovejas, se asemejan a nosotros y hablan nuestro idioma, pero no todo el tiempo con las mejores intenciones. Por la cultura, brindamos confianza y le damos la bienvenida a los que no aparentan una amenaza, sin embargo, a veces nos han dado malos consejos o hemos firmado documentos engañadores en donde hemos perdido nuestros hogares, bienes y sustentos. Estoy muy segura de que organizaciones sin fines de lucro y del derecho pro migrante lo entienden muy bien. He construido toda mi vida sobre una reputación en defensa de nuestra comunidad, y ese trabajo no empezó cuando me decidí correr para un puesto público. A Través de los años, me he ganado la confianza de mi comunidad y he trabajado para defenderla de abusos. Como diputada estatal, escribí propuestas de ley relacionadas precisamente a estos mismos temas; el derecho al pago por trabajo cumplido, las licencias de conducir-desde el 1996 cuando en aquel entonces trabajé con el Senador de mi distrito Joe Eddie Lopez, y otras propuestas alrededor de viviendas y requisitos de licencias convirtiéndolo un acto criminal por cometer fraude y practicando sin contar con una licencia. Hoy en día, sigo trabajando en el mismo tipo de trabajo voluntario. Con respecto a esta ley, mi comportamiento y postura no es diferente. Hay una nueva ley que hace el hecho de recolectar boletas un acto criminal-felonia y lleva con ella una posible multa de $150,000. Yo en lo personal, no quiero que nadie en mi comunidad caiga presa o que se vea involucrada. Como siempre, continuará proveyendo informes. Grupos con buenas intenciones no son el problema, esta práctica, en las manos equivocadas podrían causar mucho daño y podría retrasar los avances que hemos logrado. Firmemente yo creo que somos una comunidad inteligente y nos involucramos cuando lo veamos necesario. El proceso de votación es relativamente fácil; se recibe la boleta, se vota, se sella, se firma, se regresa, postage pagado. Tenemos 30 días para regresar por correo. No debemos y no deberíamos a desarrollar una cultura en la cual construimos muletas. Somos flexibles y nos levantaremos e involucrar al ser informados y capacitados. No creo que esto es una disuasión de votación para nuestra comunidad en absoluto. Nuestra comunidad es diligente y trabajadora. Somos una que no pide, sino que trabajamos por lo que tenemos, esto forma parte de nuestros valores como Latinos. No necesitamos jugar la carta de la víctima en este caso. Nuestra comunidad puede hablar por sí misma y esto se refleja en los familiar y religiosos; raíces devotas al catolicismo, cristianos y pro-vida. Amigos, vamos a ver la política y la experiencia. He dedicado toda mi vida adulta a la participación de la comunidad por necesidad personal. Mi familia se ha visto directamente afectada por los problemas que la cual he abogado y defendido en los últimos años. Mi profundidad de los conocimientos sobre los temas es mucho mayor que cualquier otro candidato que se postula para un cargo en mi distrito. He sido miembro de la junta escolar Cartwright durante 12 años, y bajo mi dirección he logrado en mejorar un distrito escolar que estaba fracasando. Cartwright es el segundo distrito más grande de las escuelas primarias en el estado, es la que más paga en salarios de los maestros y que pasó de una "F" a "B +" en un año y medio, con un presupuesto operativo de aproximadamente, 100 millones de dólares. Tamaño de la escuela, el presupuesto, la demografía y otras dinámicas son factores importantes de equiparar hacia un liderazgo exitoso. Además, he tomado mi liderazgo y sus conocimientos técnicos a niveles superiores al asumir funciones de liderazgo elegidos a nivel nacional; oficial de la Asociación Nacional de Mesas Directivas Escolares y el Caucus Nacional Hispano de Legisladores Latinos; La inmigración y la Cátedra de Relaciones Internacionales entre muchos más en los últimos años. Junto con liderando las marchas masivas del 2006 y 2007 sobre la inmigración en Arizona y al haber involucrado a Arizona en la conversación al nivel nacional habla por sí mismo. Soy una verdadera representación de mi circunscripción, estoy profundamente comprometida a hacer todo lo que pueda para aprovechar los recursos y atraer la atención a nuestros barrios. Mi voto no está en juego por grupos de interés público que están dispuestos a pagar por mi campaña así que mientras hablo como me han dicho. Me postulo para familias trabajadoras que dependen de mi servicio de representarlos. No he hecho nada menos que eso y voy a seguir haciéndolo. Phoenix, AZ -- Somos Independents is a Mexican-American woman-led organization that focuses on signaling to key swing independent voters towards moderate / centrist views. We take issue with Senator Martín J. Quezada who is sinking to another new low stalking and posting photos of his opponent's teen daughter. Former Arizona State Representative Lydia Hernandez is running against Quezada for a state Senate seat, and he should direct his attacks against Lydia -- not her family and teen daughter. Quezada's actions are representative of the Bernie Bro male chaunivist behavior. Quezada did not support Hillary Clinton during the Arizona Presidential Primary election, and though it appears he was not ready for Hillary to make U.S. "her"story (on track to become the first woman to lead our Nation), he should also remember that the State of Arizona will generally spit out extremist socialist ideas we know he supported when he helped Bernie. As a result of Bernie Sanders losing the Presidential Primary elections, Quezada blamed the Secretary of State for Bernie's loss only to later vote against adding more polling places. Somos Independents could not support self proclaimed socialist Bernie Sanders for President in light of making socialist Eugene Debs his hero. Professional decorum is in order from the state senator. We cannot support Quezada in light of formal complaints made to the Arizona State Attorney General for breaking Arizona law, but attacking teen young ladies is reminiscent of what we saw from the Bernie Bros who attacked Hillary Clinton for being a Barry Goldwater girl when she was a teenager. We are also pleased to announce that Somos Independents will be working with Arizona Republican voters to continue the Never Trump campaign. 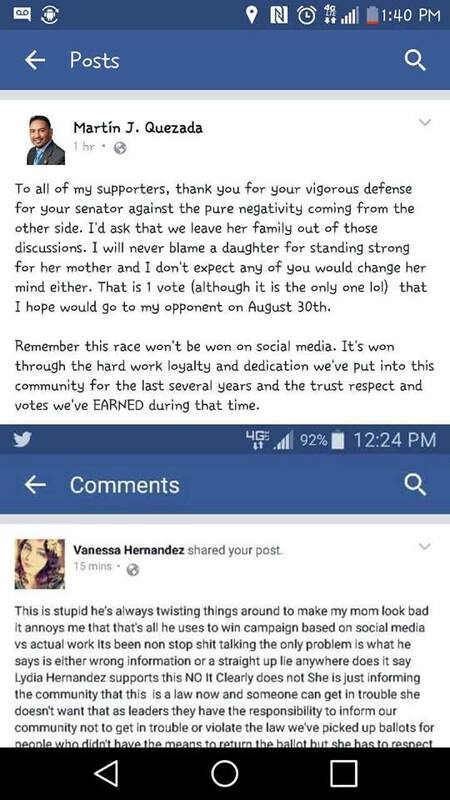 Screen shot of Quezada reposting his opponent's teen daughter FB post. Somos Independents is a Mexican-American woman-led organization that focuses on signaling to key swing independent voters towards moderate / centrist views. We take issue with Senator Martín J. Quezada who is sinking to another new low stalking and posting photos of his opponent's teen daughter. Former Arizona State Representative Lydia Hernandez is running against Quezada for a state Senate seat, and he should direct his attacks against Lydia -- not her family and teen daughter. Quezada's actions are representative of the Bernie Bro male chaunivist behavior. Former Arizona State Representative Lydia Hernandez of Maryvale, AZ, is helping family members who are related to the victims of the #‎Maryvale murderer by promoting and giving to this fundraiser. Maryvale is in Lydia's district and she is now running for Arizona State Senate in LD 29. Somos Independents is a woman-led organization that focuses on signaling to key swing independent voters towards moderate views. Our 60,000+ national member organization is also Mexican-American led and we want to take a moment to applaud Arizona Senator Jeff Flake for urging the Republican Presidential nominee Donald Trump to stop attacking Mexicans. Organizing independent voters is a difficult task but we keep slowly building our organization in light of our centrist views. We do not embrace bigotry and misogynist views. Flake stood up to Trump by urging him to stop attacking Mexicans. Trump predicted that Flake would lose his reelection, at which point Flake informed Trump that he was not on the ballot this year, the sources said. We also want to applaud the Gang of 8 Senators for revisiting fixing the clearly broken immigration system and for promoting legal immigration reform. Several members of the group that fell short of getting immigration reform into law are ready to try again. We have warned the Republican leadership for years that their continued rhetoric against immigrants and Mexican American Chicanos would cost them elections as it did in 2012 when they lost the Presidential race. We know we must work on increasing our voter participation during off-election years, however, we know we do very well during Presidential election cycles. In order for the Republican Party to begin repairing themselves, they must begin with rooting out the cancer that began with Kansas Kris Kobach when the GOP adopted an anti-immigrant platform under the leadership of the RNC Chairman Reince Preibus. The anti-immigrant platform adopted 2012 helped to produce their 2016 Republican nominee Donald Trump who is anti-Semitic, anti-Muslim, anti-woman, anti-Mexican and more. We urge the Republican leaders to look into Trump's ties whom we believe is tied directly to NumbersUSA and other John Tanton networks. Numbers USA has approximately 600,000 due paying members who appear to have a loud bark in off-election years and are organized enough to send political leaders phone calls and emails to stop legal immigration reform, however, they have a little bite when it comes to the on-election year election cycles, and they do not represent the vast majority of American voter views. Americans want legal immigration and we want to repair the broken system. We are happy to hear prominent Republicans are getting behind Secretary Hillary Clinton for President, and especially after learning disturbing news when Trump praised Saddam Hussein yesterday. Trump's praise of Hussein confirms to us he has zero experience in foreign policy because evidently Trump did not know that Hussein paid suicide bombers to kill Jewish peoples. Why is Donald Trump Rewarding Saddam Hussein Who Paid For The Jewish To Be Killed? Just in case Trump never received the memo, Israel is a United States ally. The tweet, posted at roughly 8:30 a.m., featured a picture of Hillary Clinton pasted over a backdrop of $100 bills with a six-pointed star — the Jewish Star of David — next to her face. Today on CNN, we witnessed Trump giving Saddam Hussein praise for "Killing Terrorists," but what Trump doesn't know is Saddam Hussein paid suicide bombers to kill the Jewish people. Iraqi President Saddam Hussein has raised the amount offered to relatives of suicide bombers from $10,000 per family to $25,000, U.S. Defense Secretary Donald Rumsfeld said Wednesday. Since Iraq upped its payments last month, 12 suicide bombers have successfully struck inside Israel, including one man who killed 25 Israelis, many of them elderly, as they sat down to a meal at a hotel to celebrate the Jewish holiday of Passover. The families of three suicide bombers said they have recently received payments of $25,000. Palestinians say the bombers are driven by a priceless thirst for revenge, religious zeal and dreams of glory — not greed. Mahmoud Safi, leader of a pro-Iraqi Palestinian group, the Arab Liberation Front, acknowledged that the support payments for relatives make it easier for some potential bombers to make up their minds. "Some people stop me on the street, saying if you increase the payment to $50,000 I'll do it immediately," Safi said. He also suggested such remarks were made mostly in jest. Saddam has said the Palestinians need weapons and money instead of peace proposals and has provided payments throughout a year and a half of Israeli-Palestinian battles. "I saw on Iraqi TV President Saddam saying he will continue supporting the (uprising) even if it means selling his own clothes," said Safi. Whomever is advising Donald Trump appears to be anti-Semitic as all hell. I believe Trump's anti-Jewish message is linked to the John Tanton Network.